Whether you’re single and have complete decor freedom or married with young children, you may dream of what’s next for your family room. Three bloggers — newly married, married with young children and married with teens — show us their family rooms and what’s changed over the years. Kristen from Just a Girl and Her Little Dog is a very busy woman. Recently married, she is a blogger, actress, party planner, DIY’er, decorator and mom to a precious little dog named Lola. Because of her hectic schedule, Kristen likes to keep her home “approachable and lived in.” While she would never sacrifice beauty or style in her home, Kristen does opt for comfort in her family room. She refers to her couch as a “literal down-feathered heaven.” Even Lola gets her very own teepee of cozy in the family room. Embracing the idea of having your favorite things on display, Kristen has a special place to place her bag in the family room. The framed art of the many places Kristen and her husband traveled before marriage serves as a reminder of the many memories they have made together and the many more they have coming their way. Her family room has changed to meet the needs of herself, her husband and their dog. Right now, with two working adults and a very hectic schedule, her family room reflects a space to relax. Yet it has a young appeal, just like the couple who kicks back in it. Valerie from The Caldwell Project is married with two young girls. Her blog is meant to document as Valerie juggles motherhood and remodeling her home. 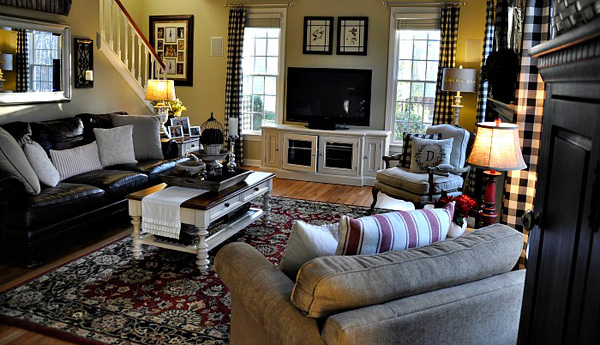 She and her husband styled their family room to meet both the social and nonsocial needs of her family. Because it’s a place that holds many family gatherings, Valerie wanted to ensure that there would be enough seating for everybody, thus choosing the sectional couch and two sitting chairs for the living room. Valerie added the “Chillax” sign as a gentle reminder “to let things go” and that the room is meant as a place of relaxation — so much so that the family keeps Nerf guns and other play equipment stocked and easy to grab in the drawers. The TV is the center of the room, as the family room is a place to gather to watch movies. Valerie mentions that she chose a soft rug meant for lying on, cuddling and playing. Once choosing style over function, Valerie says that motherhood has changed her home style significantly. Where she used to like traditional, she now enjoys comfortable. She believes her style will continue to change and evolve, just as her children will. 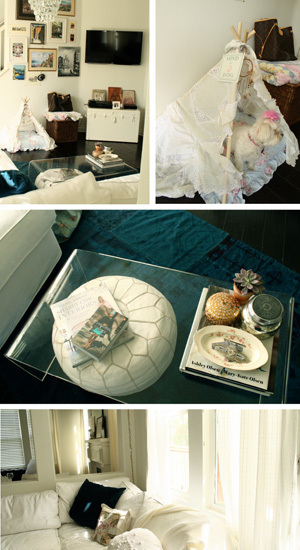 The Endearing Home is a home blog run by Lauren, a wife and mother to two teen girls and a home decor lover. After 17 years of moving, she and her family have found a home where they hope to plant their roots. In creating their new home, Lauren says that everyone has a little bit of input, especially her daughters. She mentions that when they were small she could decorate whichever way she pleased, only cautious of safety, practicality and comfort. Now that her girls are older, Lauren has a bit more freedom with her design. However, her girls are her biggest decor fans but also her biggest critics, telling her if they like or dislike something, although Lauren admits they are more often right than wrong. Lauren’s family room is the family’s central point where they all gather to watch television and movies and play games. Considering that it is everyone’s space, Lauren states that the family voted on the paint color, her husband opted for the club chair and larger TV, and she chose the rug and French-styled chair, as well as other smaller decor pieces. Lauren admits that she is still cautious when it comes to purchases, because although her girls are older, they are still messy. She keeps the big rug to hide spills, has washable pillow covers and organizes using baskets and cabinets. 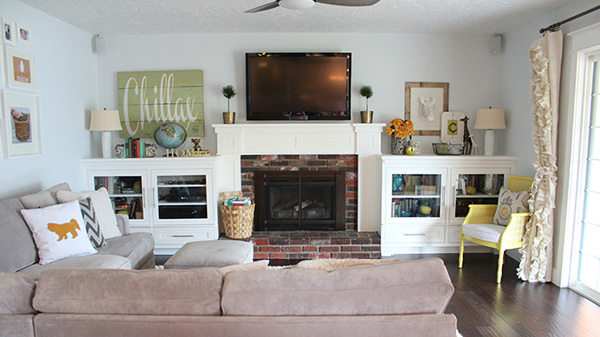 All of the opinions, ideas and input make Lauren’s living room the perfect cozy space for her family’s needs.